Most European men descend from just three Bronze Age dominant forefathers who began a ‘population explosion’ several thousand years ago. A research team from the University of Leicester looked at the DNA sequences of 334 men from 17 European and Middle Eastern populations. The study shows that almost two out of three modern European men (64 per cent) were descended from just three males. Archaeologists have been puzzled about whether European populations started to surge in the stone age or later. But the new research appears to suggest that there was a rapid expansion of communities in the succeeding Bronze Age. It appears that that between 2,000 and 4,000 years ago there was a raid explosion in the size of populations from the Balkans to the British Isles. Professor Mark Jobling from the Department of Genetics at Leicester University said: “The population expansion falls within the Bronze Age, which involved changes in burial practices, the spread of horse-riding and developments in weaponry. Now the team is hoping to study skeletal remains to see if they can pinpoint the exact period that triggered the sudden population expansion. Study lead author Chiara Batini, from the University of Leicester’s Department of Genetics, added: “Given the cultural complexity of the Bronze Age, it’s difficult to link a particular event to the population growth that we infer. 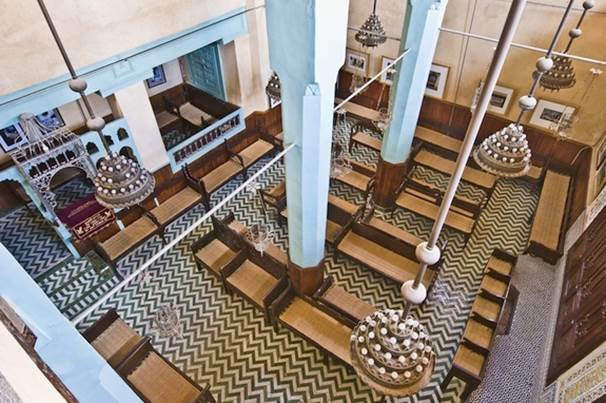 The Aben Danan Synagogue in Fez, Morocco, brings a North African flare to the Jewish faith. A new genetic map paints a comprehensive picture of the 2,000 or so years in which different Jewish groups migrated across the globe, with some becoming genetically isolated units while others seemed to mix and mingle more. The new findings allow researchers to trace the diaspora, or the historical migration, of the Jews, which began in the sixth century B.C. when the Babylonians conquered the Kingdom of Judah. Some Jews remained in Judah under Babylonian rule, while others fled to Egypt and other parts of the Middle East. Jewish migrations have continued into the day. The study researchers found that the genomes of Jewish North African groups are distinct from one another, but that they show linkages to each other absent from their non-Jewish North African neighbors. The findings reveal a history of close-knit communities prone to intermarriage, said leader Harry Ostrer of the Albert Einstein College of Medicine in New York. The researchers worked with local communities to get volunteers to blood samples for genetic analysis. The current study analyzed the genes of 509 unrelated North African individuals, comparing them across groups. Similar work has been done linking ancient Israeli and Syrian people to Ethiopia. The results revealed close relations between North African and European Jews, Ostrer said. The researchers also found two distinct groups of North African Jews, one comprised of Libyan and Tunisian Jews and the other of Moroccan and Algerian Jews. These groups were more likely to share DNA segments than other Jewish groups, indicating more shared genetic history. “I like to think of Jewishness as a tapestry with these DNA segments representing the threads that weave the tapestry together,” Ostrer said. Non-Jews can convert to Judaism, but membership in the group is also passed down along a matrilineal line, meaning Jewishness straddles the line between religion, ethnicity and culture. The findings tended to track with what is known of the history of the Jewish Diaspora, or spread of the Jewish people, through North Africa. For example, there was evidence of gene-sharing between North African Jews and non-Jews, but generally not recently, the researchers found. “This tends to fit the historical observation that during Islamic times from roughly the eighth century to roughly the 20th century, there was limited intermarriage between Jews and non-Jews,” Ostrer said. Among Moroccan and Algerian Jews, there was evidence of some mixing with the Sephardic Jews who trace their roots to the Iberian Peninsula. Again, the genetic results the known history of Sephardic Jews leaving Spain and Portugal, with some settling in Morocco and Algeria. The most recent movement began in the late 1800s and continues today, with immigration to the United States, Israel, Canada, Australia and South Africa, Ostrer said. The United States and Latin America tend to be a “melting pot” of genetics, Ostrer said — 50 percent to 60 percent of American Jews marry someone of a different religion or ethnicity — but the “Old World” genetics of European and North African Jews are helpful in understanding certain diseases. In these populations, people married within their communities and even within their own for centuries, allowing studies on relatively few people to be extrapolated more widely throughout the population. In a similar example, researchers recently found a gene that protects against Alzheimer’s disease in Icelandic populations. Those results were reported July 21 in the journal Nature. The same sort of research is possible in Jewish populations, Ostrer said. “It represents an extraordinary resource that is much harder to do, for instance, in the European-American population, because there has been such a melting pot occurring there,” he said. 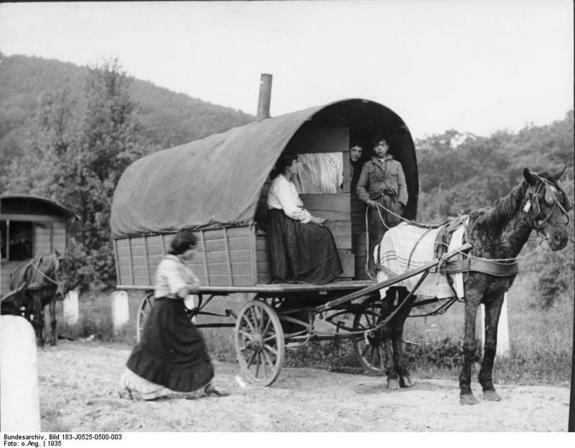 Romani with their wagon, photographed in the Rheinland of Germany in 1935. Europe’s largest minority group, the Romani, migrated from northwest India 1,500 years ago, new genetic study finds. The Romani, also known as the Roma, were originally dubbed “gypsies” in the 16th century, because this widely dispersed group of people were first thought to have come from Egypt. Today, many consider “gypsy” to be a derogatory term. Linguistic history as well as a few limited genetic studies had already suggested the Romani originally hailed from India. 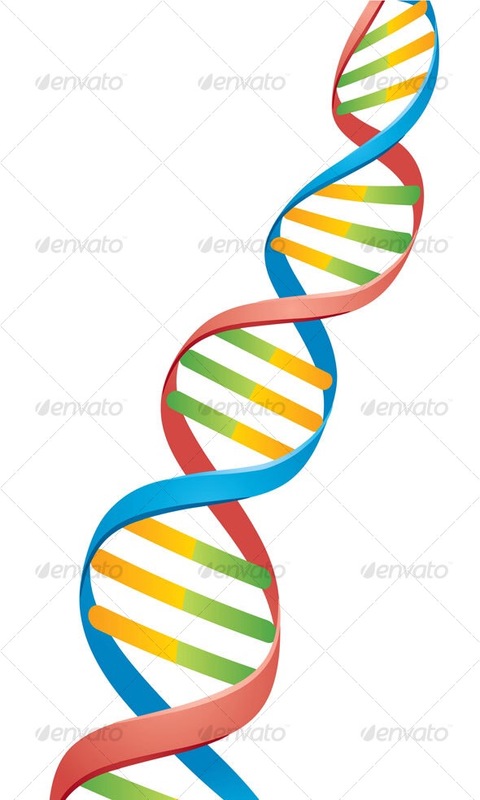 To confirm this idea and uncover more details on the migration, Comas and his colleagues used a technique that compares DNA segments from across the whole genome with that of other populations. They used DNA samples from 13 groups of Romani spread across Europe. “In our study, we do not focus on specific regions of the genome, but on the genome as a whole, which provides us the complete genetic information of the populations under study,” he told LiveScience. The results revealed the modern Romani’s ancestors migrated out of northwest India all at one time 1,500 years ago, Comas and his colleagues report today (Dec. 6) in the journal Current Biology. Once they arrived in Europe, they spread across the continent from the Balkan region about 900 years ago, Comas said. Comas said he hoped to later widen the analysis to include more Romani groups as well as more Indian populations from the region where the Romani originated.